Picture the scene: you own a desirable car and you don’t want it to get stolen. Of course you don’t. But you also want to park illegally and get away with it, so how do you make your car immune to the charms of both thieves and tow trucks? Naturally, we turn to Mother Russia and YouTube channel Garage 54 for an answer. Apparently Russians have started actually chaining their cars to lamp posts, running heavy metal links between immovable roadside furniture and their cars’ door handles, pillars, wheels or even the steering wheel in an attempt to put tow truck drivers off. The channel’s latest video explores these weird new trends and finds them all totally useless if you’d like to prevent the car being stolen. They all just damage the car itself, pulling bits off as easily as if they were never even fixed on at all. 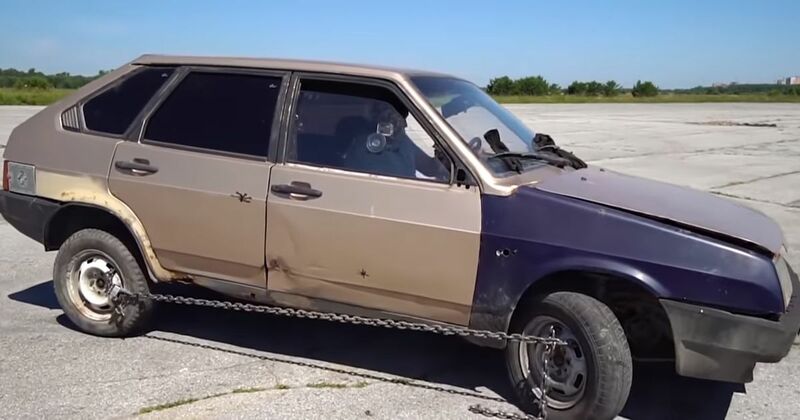 But, not to be defeated, our intrepid host also tries chaining the almost-dead test car’s steel wheels to each other; first the rear wheels together and then a front to the rear one on the same side. Both are pretty successful, especially the front-to-rear link. Just try to ignore all the damage it will do to your car, and hope the tow truck company doesn’t bring a crane.